A schedule for the 2018 Single Reed Summit is now available! Check it out and make your plans to attend March 23-24! 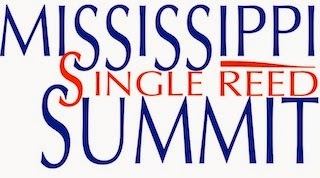 Click on the link above to register for the 2018 Mississippi Single Reed Summit, to be held at the University of Mississippi on Friday, March 23 and Saturday, March 24! You can also find out more about our guest artists below. Similar to last year, Friday afternoon events will be directed specifically at middle school students, followed by Friday evening recitals for all interested and the general public. Saturday events will be intended primarily for high school and college students. Click on the "Schedule" link in the menu above to find out more about events. There is a $5 registration fee for those who wish to participate. We hope to see you in Oxford on March 23-24 for the Summit! Jorge Montilla is considered one of the finest clarinetists in Latin-America and one of the world’s best Eb Clarinet players. Mr. Montilla is a graduate of Indiana University, where he studied an Master Degree and an Artist Diploma with Howard Klug. Other notable teachers include Luis Rossi, Walter Boeykens, Antony Pay, Jonathan Cohler, and Ricardo Morales. Former Principal Clarinet of the Simon Bolivar Symphony Orchestra, Montilla has appeared as soloist with numerous Venezuelan orchestras, the Indiana University Chamber Orchestra, the Vale Veneto Festival Orchestra in Brazil, the Longwood Symphony Orchestra of Boston, the Aruba Symphony Festival Symphony Orchestra, the National Symphony of Ecuador and the Youth Orchestra of Peru. As a founding member and Artistic Director of the Caracas Clarinet Quartet, Mr. Montilla has performed extensively throughout the world, has recorded two CDs (the second featuring Paquito D’Rivera), and has become known as one of the preeminent composers/arrangers for clarinet ensemble. Montilla’s pedagogical experience includes teaching at Arizona State University, at Longy School of Music of Bard College and he has been Chairman of the Clarinet Department at the Conservatory of Music Simón Bolívar and clarinet professor at the Latin American Academy of Venezuela. At the present, Jorge Montilla is Assistant Professor of Clarinet at University of Iowa School of Music. Jorge Montilla represents Rossi Clarinets, D’Addario, Clarinetclassics, Royal accessories, BG ligatures and Lefreque sound bridges. His compositions and arrangements are published by both Woodwindiana Editions and Montilla Brothers Editions. He is also a columnist for the International Clarinet Association’s magazine “The Clarinet” and keeps a hectic international career as soloist and clinician. Dr. James Umble is Professor of Saxophone at Youngstown State University where he has been awarded a Distinguished Professor Award in teaching. He is a nationally recognized teacher, clinician, soloist, recitalist and chamber musician. A recent concert at the Cleveland Museum of Art led Cleveland Plain Dealer critic Donald Rosenberg to write "...Umble must be one of the most elegant exponents of his instrument...he was virtuosic in every way...". He has performed as a concerto soloist with the United States Navy Band in Washington D.C. , the Youngstown Symphony Orchestra and at recent National Conferences of The North American Saxophone Alliance. He has recently joined the wind section of the Cleveland Orchestra, performing saxophone excerpts under conductors Franz Welser-Most, Pierre Boulez, JaJa Ling and Giancarlo Guerrero. During the Orchestra’s recent tour to Miami Florida the Miami Herald wrote that Umble’s playing was “…glorious...” and of his “…mellifluous tone…”. He served on the faculty of the Xi’an (China) Clarinet and Saxophone Conference and as well was a featured soloist at the State University of Potsdam (NY) First Annual Single Reed Conference. He has recently performed solo recitals at Western Michigan University, Penn State University and at George Mason University. He has recently presented master classes at The University of Miami (FL), The University of Oregon, The University of Southern Oregon, Illinois State University, New Mexico State University, The University of New Mexico, SUNY Potsdam (NY) and many other institutions throughout the country. His acclaimed reference book, “Jean-Marie Londeix, Master of the Modern Saxophone”, which describes the life and pedagogy of one of the world’s most beloved French saxophone artist/teachers, is a standard reference text in use around the world. His recording of works for saxophone “Dejeuner sur l’herbe” has been warmly received for more than ten years now and is available through online vendors. He can also be heard on compact disc performing the music of Florent Schmitt (AUR), Michael Colgrass (NAXOS) and Evan Chambers (Cambria). His recording of Marilyn Shrude’s Concerto with the YSU Wind Ensemble under the direction of Stephen Gage is on that groups CARNIVAL recording.